We should all be eating more vegetables, right? Whether you serve these waffles for a family breakfast or a family dinner, the hefty helping of carrots and zucchini folded into the batter will add to your daily produce tally in a sweet way. Pop extras into the freezer to toast up on busy mornings! 1. Preheat a waffle iron according to manufacturer directions. 2. In a medium bowl, whisk together the dry ingredients (flour, sugar, baking powder, and cinnamon). 3. Add the eggs and milk and mix well. 4. Whisk in the melted butter until the batter is smooth and thick. 5. Fold in the carrots and zucchini. 6. 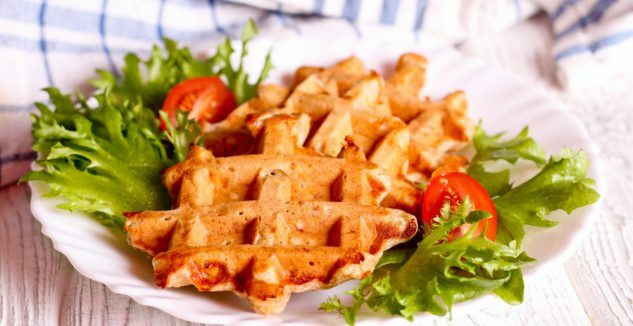 Cook the waffles according to your waffle iron’s specifications. Serve warm, with maple syrup or a sweet flavored cream cheese!